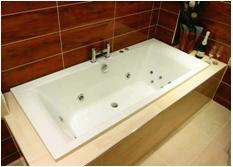 At Value Tile & Stone Affair we aim to cater for all individual styles and dispositions. Whether you require a contemporary bath to compliment your modern bathroom or a traditional tub to match your more classic tastes, we have the perfect bath for you. Whilst comfort and practicality remain in tact, our range of baths ooze elegance and style and provide an ultimate place of relaxation. Please click on a link below to view our exquisite range.